You’ve done your research and interviewed lots of potential candidates for your household employee position. Whether it’s a nanny, an in-home senior caregiver, or someone else that will work regularly in your home with you, making the decision to hire the right person can feel like a lot of pressure. And more than likely, you have questions on what your responsibilities are for paying taxes on your household employee. If you have hired a household employee and you’ve paid them more than $2,100 in wages this year, you’re officially an employer and you’re required to pay Medicare and Social Security taxes. You will also need to make sure to report your nanny’s taxes and income in addition to paying employment taxes on your federal income tax return. Most states will require employers to file every quarter, but state and federal thresholds are often different, and it is dependent on annual or quarterly wages. Sound confusing? 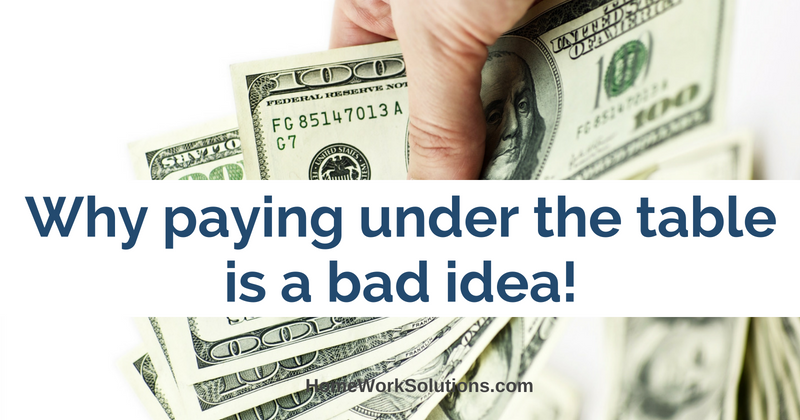 Don’t be tempted to pay your household employee “under the table” or “off the books.” It might initially sound like you’ll be able to save time AND money, but this decision could have costly consequences if you get caught, especially if your household employee files for unemployment benefits later. All nanny and senior care jobs end. When that caregiver is let go, can you be sure they won't need unemployment to pay their bills until they start a new job? To avoid any disturbance with the IRS or with your household employee, you’ll need to factor in the tax obligations that come with this person’s employment, right from the start. Anything over $2,100 means you’re required to pay taxes. Not sure how to properly withhold the right amount of taxes from your employee’s paycheck each pay day? Enrolling in HomeWork Solution's household tax preparation service can provide you important peace of mind that you’re doing things right and that there will be no hidden tax surprises later. We’ll get you registered with the IRS, get tax identifications ready, and check to make sure your household employee is getting paid accurately, with the right amount of taxes being withheld all year long. No one enjoys paying penalties or fees. So, save yourself a headache and plan ahead by paying your household employee the right way, from the very beginning.